Learn the Trigger finger-open release surgical technique with step by step instructions on OrthOracle. Our e-learning platform contains high resolution images and a certified CME of the Trigger finger-open release surgical procedure. Triggering of digits (stenosing tenovaginitis) is most common in women between 50-60 years of age. The thumb and ring fingers are the most commonly effected digits with the right hand more commonly effected than the left. Most cases are idiopathic although certain factors such as repeated power gripping or trauma may be causative. This section does not discuss congenital trigger thumb/finger which has a different pathology and treatment pathway. Medical conditions such as diabetes, gout and rheumatoid arthritis have also be implicated in the development of the condition. The issue occurs at the A1 pulley due to narrowing of the flexor sheath or bulging or of the tendon causing pain and restriction in movement. The pathological process which occurs at the A1 pulley is an evolution from dense compact parallel collagenous bundles to an irregular patter of fibrous tissue with chondroid metaplasia of the pulley with deposition of hyaluronic acid, chondroitin sulfate and proteoglycans. On the palmar aspect of the hand there are commonly 2 transverse creases. The proximal and distal palmar crease. These creases are created as the metacarpophalangeal joints (MCPJs) flex and are arranged in an overlapping fashion due to the length of the metacarpals with the middle finger longest, then the index, then the ring and finally the little. 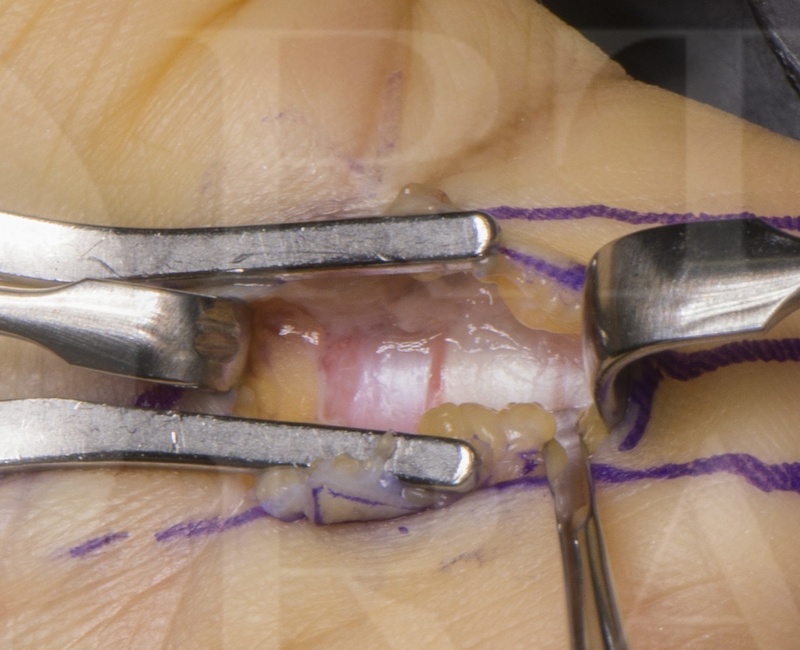 The distal palmar crease starts at the junction of the glaberous and non-glaberous skin on the ulnar side of the palm and extends, drifting slightly distally, level with the second web space. The proximal palmar crease extends from the radial border of the hand at the junction of the glaberous and non-glaberous skin starting at the same distal to proximal distance along the palm, drifts slightly proximally and terminates level with the 4th web space. Open release of the A1 pulley is a procedure usually performed for recurrent of persistent triggering refractory to non-operative treatment. The procedure can be performed as a day case under local anaesthetic and takes around 15 minutes for an experienced surgeon. The patient has a simple dressing and is asked to mobilise as able as does not usually require any hand therapy input. After 3-6 weeks the scar softens and full use of the hand, including tight gripping, is possible. Author: Mr Mark Brewster FRCS (Tr & Orth).